Today – Thursday, May 23rd – will witness the display of a secret Republican plot to maintain the City Council District 2 seat now held by Kevin Hawkner, a Republican who is termed out. Former Republican old guard, Byron Worn, who used to hold the seat, will be on hand to assist in the dedication. Byron used to be a lifeguard until he propelled his political career off the backs of the Lifeguard Employee Union and into the City Council seat – this was years ago – but his appearance today will confirm his continued involvement in local politics. Also on hand will be Republican Lori Zapped. She has just recently announced that she intends to run for the seat being vacated by Hawkner. Zapped currently holds the seat for District 6, but city council district boundaries lines have changed recently, and one day, Lori woke up to find herself in Kevin’s district. Kevin didn’t mind. He is definitely termed out and observers say they think he will run for mayor once Mayor Filter is elected governor. In fact, Mr Hawkner, My Worn and Ms Zapped have clearly come up with a secret plan to have Zapped installed next year once their plan for her victory is complete. And the plan is all wrapped around the bronze statute being dedicated today. You see, both Hawkner’s office and Zapped’s office gave money towards the statute. Thousands. A total of $20,000 was contributed by these donations from these GOP officer holders. Ah, herein lies the crux of the matter. Lori Zapped has nothing to do with lifeguards, yet here she is putting her good money towards the statute, and in effect, putting her stamp onto a footprint on the waterfront of Ocean Beach. And Mr Hawkner and Mr Worn will both be tooting her horn, just you watch and see. 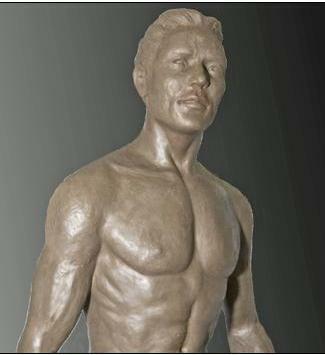 It’s going to be a downright Republican slapfest over this statute, where Republicans congratulate other Republicans on doing a good job, in honoring lifeguards with this bronze, life-size figure. Yet, all these Republicans – while gleefully gloating over their comrade’s accomplishment – are demonstrating their own hyprocises to a degree unequaled in this week’s news cycle. For it is these very same Republicans who want to cut back on government until it is small enough to drown in a bathtub – as Grover Norquist – their hero – advocates. But what and who are lifeguards other than those public servants who have seen their ranks and equipment thin and age, due to the cut-backs by these Republicans who now honor them with a statute. I guess they’d rather have a statute of a lifeguard than a real lifeguard, fully funded and with full benefits, health care and pension. If it wasn’t for the union that represents lifeguards, they wouldn’t have the benefits and salaries they have now. But again, it is these same Republicans who have striven to vilify these very same public employee unions. Rather a bronze statute than negotiate in good faith with the union that represents the real lifeguards. Bryon Worn, himself a former lifeguard, has used his experience and connections to get an initiative to privatize lifeguard services in front of the City Council next year, once Ms Zapped is elected. Coincidentally, Mr Worn has recently established a “pay-as-you-go” private lifeguard service. Swimmers, in order to be saved by these private lifeguards, have to agree to pay a fee, and if they do, then of course, they will be saved. If they don’t, then City lifeguards will be called in to make the save. Ah, but Mr Hawken, Ms Zapped, and Mr Worn – we have found you out, and have discovered your shenanigans. Please, take the politics out of honoring our lifeguards and the victims who drowned forcing the city to establish lifeguards. yet isn’t it the lowest form of humor to make fun of people’s names? fairly naked account of poking fun at our local politicians. Duh! And your problem with that is …? Bodysurfer – Not if it’s satire! That’s the whole point, gumba!.